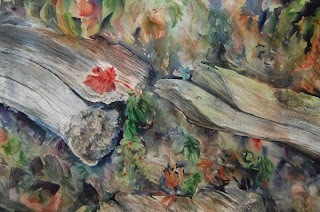 Deadwood Trio - watercolor painting by Angela Fehr, 14" x 21"
I've been working on my muskeg painting again and have reached the point where I am adding detail and it never looks any different. Think that means I have to call it finished! Seems like putting it on my computer monitor helps me see it in a new light so I'll post it and see how I feel about it. What do you think? The other project that has me busy is filling Paper Me doll orders for my online store. I have five orders going right now. 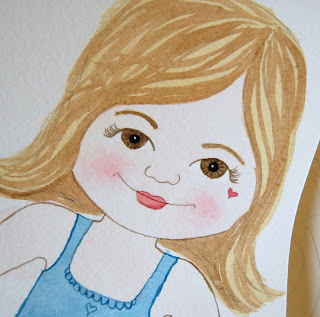 It's such a fun job because the little girls I am painting are so cute! And it is fun knowing how excited they will be to receive them. The loved ones who order the dolls are always excited to be giving the dolls, so it's a really energizing thing to be a part of. I'd like to receive just enough orders to keep me in scrapbooking supplies (that's been eating up a lot of dollars these days) and yet not be so busy that I'm overwhelmed. I'm hoping I won't have to turn down any orders but as Christmas nears, I'll slow production on the dolls. Just to let you know in case you were considering ordering one for a child you love (I do boy dolls too!). I'm hoping to start a new painting celebrating the colours of fall. Around here, snow will be blanketing the ground soon (the weather forecast says Thursday) and the leaves have long ago blown off the trees. So things look pretty brown. I much prefer the vibrancy of the landscape when the leaves are turning all colours. Though right now the more subdues hues mean I can focus on the beauty of the sky without distraction!